Bronchogenic cysts occur due to the anomalous development of the primitive tracheobronchial tree early in fetal life. They are usually present in middle mediastinum. Rarely, they have been found in other locations. We describe two patients with subcutaneous bronchogenic cysts located over manubrium sterni with special emphasis on the difficulties in pre-operative diagnosis. The two boys were managed by complete excision of the cysts. The children are well on follow-up. Bronchogenic cysts are congenital lesions that originate from the tracheobronchial tree in the sixth week of gestation. , Their usual site is middle mediastinum,  but infrequently these have been reported to present as a subcutaneous swelling or sinus. Less than 70 cases of subcutaneous bronchogenic cysts have been reported till date. , We report two cases managed by us with a brief review of the literature. A 3-year-old healthy male child born to non-consanguineous parents presented to the out-patient department with a complaint of a swelling in midline overlying the upper chest. The swelling was first noticed in neonatal life and was growing with age. There were no associated symptoms. On examination, the general physical and systemic examinations were unremarkable. There was a swelling over the manubrium sterni measuring 3 cm in diameter with normal overlying skin and no punctum. The swelling was non-tender, smooth, cystic and freely mobile in all directions. No other similar swellings could be found. Surgical exploration revealed a 3-cm cyst with a glistening surface in subcutaneous space. Overlying skin and underlying fascia were free. The cyst ruptured accidentally during removal spilling clear mucoid contents but was completely excised. The post-operative recovery was uneventful. 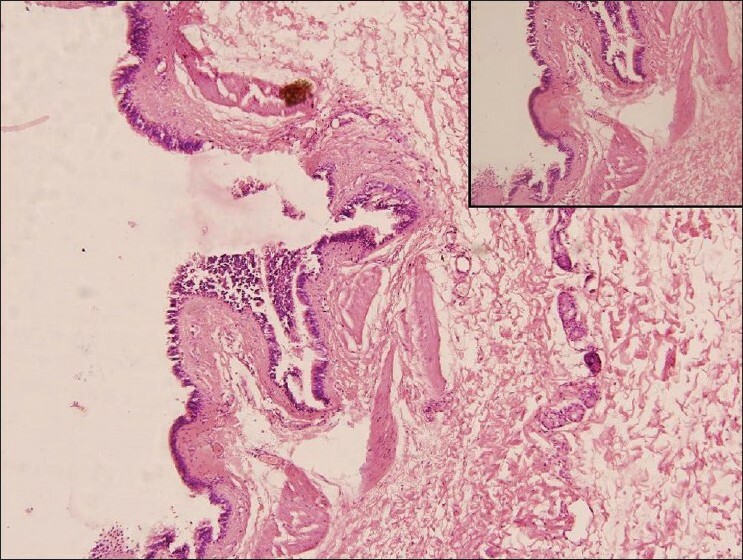 The histopathological examination revealed it to be a bronchogenic cyst [Figure 1]. There is no recurrence on follow-up at 18 months. A 3.5-year-old boy born to non-consanguineous parents presented to the hospital with a history of a intermittent watery discharge from the suprasternal area since birth. There was no history of any previous swelling in the region. There was no history suggestive of previous infections, trauma or surgical intervention. On examination, a sinus opening was seen in the suprasternal notch [Figure 2]. The surrounding skin was normal. A swelling about 2.5 cm in size could be palpated underneath the sinus and was non-tender, smooth and mobile. There was no clinical evidence of extension into the thoracic inlet. The chest radiograph was normal. The fine-needle aspiration cytology (FNAC) revealed clusters of benign round to polygonal cells with focal nuclear enlargement and occasional mitosis. Some cells showed squamous differentiation, and a fair number of ghost cells and multinucleated giant cells in a dirty background were seen. The possibility of pilomatrixoma or dermoid tumour was suggested. At surgical exploration [Figure 3], the cyst was situated in the subcutaneous space and had a glistening surface while the overlying skin and underlying fascia were free. The swelling was overlying the trachea but not extending into the chest. Complete excision could be accomplished easily with an uneventful recovery. The histopathological examination of the specimen confirmed it to be a bronchogenic cyst. There is no recurrence at 1-year follow-up. The exact incidence of the bronchogenic cysts remains unknown. The diagnosis of bronchogenic cysts was found in about 1 in 42,000-68,000 admissions in surgical wards. The first cutaneous bronchogenic cyst was reported by Seybold and Clagett in 1945. Since then, only less than 70 cases of cutaneous bronchogenic cysts have been reported. Males are affected about four times more commonly as compared to female children. ,, These cysts have been found mainly in the neck and upper thorax, and rarely in the shoulder, chin, mediastinum and abdominal cavity. Among all the cases, the pre-operative diagnosis was made in only one and in rest it was a histopathological surprise. The differential diagnosis includes cutaneous ciliated cyst, thyroglossal duct cyst, epidermal inclusion cyst, branchial cyst, dermoid cyst and trichilemmal cyst. The diagnosis can be made on histopathology only. The FNA cytology findings in bronchogenic cysts have been described. , The FNA cytology shows a group of columnar, ciliated cells, some of them with abundant cytoplasm and eccentric nuclei in a proteinaceous or clean background. Histiocytes, lymphocytes, refractile crystals and necrotic debris may be identified. Even with the knowledge of the findings, pre-operative diagnosis is difficult in the absence of a high index of suspicion as exemplified in our second case. The histopathological features to differentiate this entity from branchial cysts are overlapping and are a point of debate. ,, Classically, the bronchogenic cysts show ciliated respiratory epithelium whereas the branchial cysts demonstrate stratified epithelium in more than 90% of cases. Lymphoid tissue is seen in >90% of branchial cysts while it is classically absent in bronchogenic cysts. The smooth muscle is seen in 70% of bronchogenic cysts while it is rare in branchial cysts. The presence of cartilage, a feature supporting bronchogenic cysts, virtually rules out branchial anomaly. Regardless of the findings described, all the authors have reported confusion in the histopathologic differentiation. The management of bronchogenic cysts requires complete excision. Care needs to be taken for complete excision as the only complication reported to date with cutaneous bronchogenic cysts is recurrence after incomplete excision. The surgical approach includes an elliptical incision over the swelling to approach the cyst and care to excise the cyst completely and rule out intrathoracic extension. Also, as the cyst lies in a visible area, due care should be given so as to give the child a cosmetically acceptable scar. 1. Zvulunov A, Amichai B, Grunwald MH, Avinoach I, Halevy S. Cutaneous bronchogenic cyst: Delineation of a poorly recognized lesion. Pediatr Dermatol 1998;15:277-81. 2. Beyer LG, English JC 3rd, Halbach DP. Presternal bronchogenic sinus with pedunculated lymphoid aggregate. Am J Dermatopathol 2000;22:79-82. 3. Di Lorenzo M, Collin PP, Vaillancourt R, Duranceau A. Bronchogenic cysts. J Pediatr Surg 1989;24:988-91. 4. Carden C, Dykes E, Pollock AM. An unusual midline swelling: Case report of a cutaneous bronchogenic cyst. Eur J Pediatr Surg 2008;18:345-6. 5. Shah SK, Stayer SE, Hicks MJ, Brandt ML. Suprasternal bronchogenic cyst. J Pediatr Surg 2008;43:2115-7. 6. Grafe WR, Goldsmith EI, Redo SF. Bronchogenic cysts of the mediastinum in children. J Pediatr Surg 1966;1:384-93. 7. Desforges G. Primitive foregut cysts. Ann Thorac Surg 1967;4:574-7. 8. Fraga S, Helwig EB, Rosen SH. Bronchogenic cysts in the skin and subcutaneous tissue. Am J Clin Pathol 1971;56:230-8. 9. Bagwell CE, Schiffman RJ. Subcutaneous bronchogenic cysts. J Pediatr Surg 1988;23:993-5. 10. Park HS, Son HJ, Kang MJ. 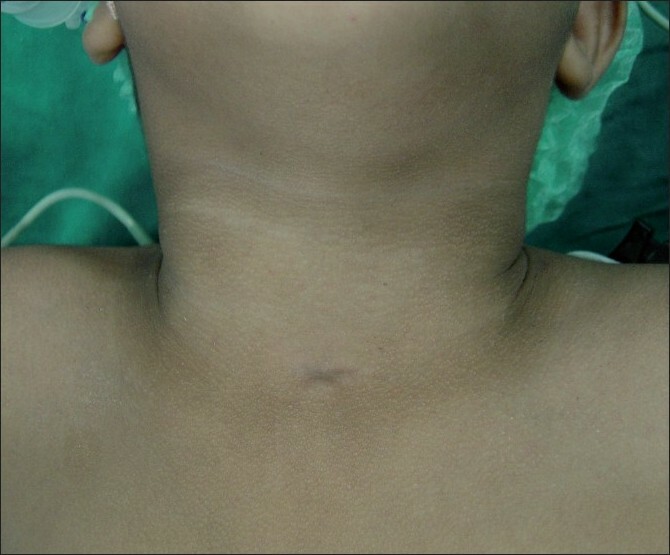 Cutaneous bronchogenic cyst over the sternum: A case report Korean J Pathol 2004;38:333-6. 11. Seybold WD, Clagett OT. Presternal cyst. J Thorac Cardiovasc Surg 1945;14:217-20. 12. Kumar PV, Ashraf MJ, Safaei A, Ali Ghayoomi S, Moosavi H, Davari HR. Fine needle aspiration diagnosis of bronchogenic cysts. Acta Cytol 2001;45:656-8. 13. Perez-Alonso P, Fernandez-Fernandez I. Fine needle aspiration cytology of a cutaneous bronchogenic cyst. Acta Cytol 2003;47:524-6. 14. Muezzinoglu B, Sozubir S, Tugay M, Guvenc BH. Histological and clinical overlapping. Am J Dermatopathol 2001;23:278-9. 15. Zvulunov A, Avinoach I. Branchial cleft anomalies and bronchogenic cysts are two unrelated disorders of embryogenesis. Pediatr Dermatol 2000;17:332-3. 16. Tanaka M, Shimokawa R, Matsubara O, Aoki N, Kamiyama R, Kasuga T, Hatakeyama S. Mucoepidermoid carcinoma of the thymic region. Acta Pathol Jpn 1982;32:703-12. 17. Mizukami Y, Matsubara F, Hashimoto T, Haratake J, Terahata S, Noguchi M, et al. Primary mucoepidermoid carcinoma in the thyroid gland: A case report including an ultrastructural and biochemical study. Cancer 1984;52:1741-5.